The state of denial of the Syrian regime’s orchestra has reached unprecedented levels. 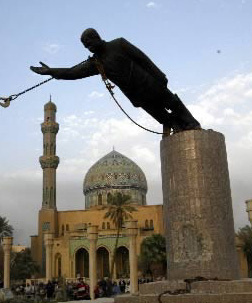 Denial of everything was what characterized the regime’s response to the uprising from its start in March 2011. The regime denied ‘anything’ happening at first, then denied the peacefulness of the protests, then theydenied the of existence of army defectors (but not so of armed gangs). They even denied the fall of Tripoli and Qaddafi in summer 2011 saying everything was pre-recorded in Qatari studios and Aljazeera fooled us by airing the film which led later to the actual fall of Qaddafi. Despite the rumours that there are anti-regime protests in the country for the past 11 months, and rumours that they are being fired at, and persecuted, and that parts of the country are not the under the government rule anymore, and that some of these parts are under siege and heavy bombardment, Syrians are heavily turning up today to the ballot boxes to say YES to the new draft of the constitution. 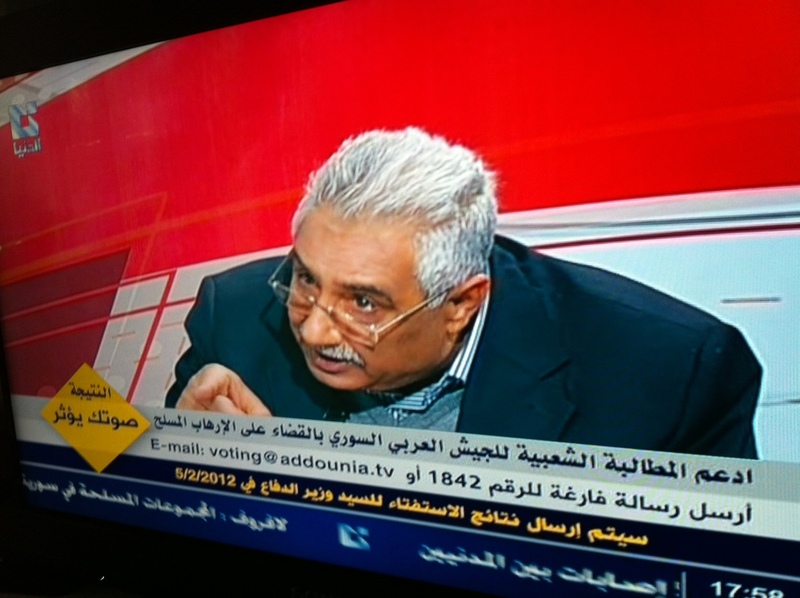 If there is any joke in the Syrian revolution, it’s the Addounia TV, the private channel linked to the Syrian regime. Addounia was always the masquerade of all the [state] media reporting on the uprising since its start in March 2011. Even the Arab League is ahead of Lebanon! In response to Syria’s crackdown on its uprising, and with all its decay, the Arab League [of dictators] has marked a historic milestone in its career by suspending Syria’s activities in its organisation. Before the ongoing Arab Spring, this move took place only once when Egypt was expelled due to its unilateral peace initiative with Israel in 1979 (& Libya in 2011); how times change. This is really a big slap in the face, with Syria being ‘the beating heart of the Arab Nation’. It might be a brave move on the face of it in Syria’s case, but it can only show the Arabs fear from the growing Iranian influence in the region, or simply the delusional rising power of Qatar, or a mix of both (you can check the legal basis of the decision here). Not even propaganda, but what’s this? If you read this blog, you are less likely you watch the Syrian state media or the ones affiliated with it (unless the ‘Moukhabarat’ started following me). So I thought of posting this below video, your opportunity to listen to some of the rhetoric being said on these ‘media outlets’.